Gourmet Girl Cooks: It's Friday Night and We're Having Breakfast for Dinner! It's Friday Night and We're Having Breakfast for Dinner! Well, it is finally Friday night and hubby and I are both tired...it has been a long week and with the unseasonable heat all week (80's), I was ready to spend a quiet Friday night at home and relax. Oh, I forgot to mention that the pollen count today was 2,979...can you believe that? And it is only mid-March! Of course, hubby wanted to go "out to eat"...and I just wanted to "chill at home"....so I told him that if we ate dinner in, I would make him an awesome breakfast for dinner in less than 30 minutes! He conceded...and I proceeded...to put together an amazing "breakfast dinner". We rarely ever eat a breakfast like this anyway...I can count the number of times in a year on one hand and still have fingers left! Christmas morning is always a big breakfast morning and maybe a couple of other times during the year...so for us, this kind of breakfast-dinner really is a treat. On our dinner menu tonight was: Scrambled eggs w/ cheddar cheese (I mixed half real eggs and half Egg Beaters and scrambled with "fat-free" half-n-half & stirred in shredded cheddar cheese right at the end of cooking); turkey sausage links (by Jimmy Dean...they are lean and delicious - if you haven't tried them, you should); hash browns (fresh shredded potatoes made by Simply Potatoes, browned in some olive oil, seasoned with sea salt and fresh ground black pepper); toast (grainy Health Nut bread made by Arnold); cinnamon chip scones (refrigerated baking dough by Immaculate Baking Co.)...and some fresh clementine (a variety of mandarin orange) slices. We had coffee with our "dinner" and hubby had juice too. The scones took 18 minutes to bake. While they baked, I started my hash browns on the stove...and they take about 7-8 minutes per side to brown and cook; scrambled and cooked the eggs in another pan, popped the toast into the toaster, peeled the clementines, and as I began plating the food, popped the sausage (that are found in the refrigerated section of your grocery store) into the microwave for about 1 minute...and Boom...breakfast-dinner is served! Literally the meal was ready in just under 30 minutes. Oh how I love breakfast for dinner! Check out the pictures below...before I baked the scones, I sprinkled them with cinnamon sugar...they are not very sweet, which is perfect with coffee! P,S. -- One thing I wanted to share with you is one of my obsessions. I self admittedly have a "dish fetish"...I just can't help myself when I see beautiful dishes. I have so many "complete sets" of dishes...and numerous other "odds & ends" that I have bought over the years. 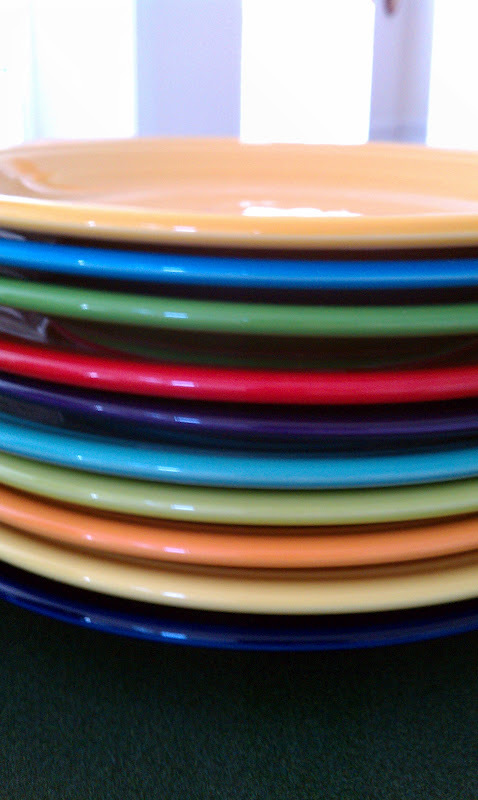 Unfortunately, I just don't have the space any more to store any more dish sets. So now, I limit myself to buying only the pieces I like best. I have had my eye on "Fiestaware" for years now. If you know anything about Fiestaware, you know that they are large, heavy dishes that come in a vast array of beautiful colors....lots of bright colors. I have never been able to decide on a particular color which is why I haven't bought them before now.. Well...finally, I thought to myself one day...why just choose one color....and suddenly the light bulb came on and a couple of weeks ago, I ordered 10 dinner plates...one of each of my favorite colors! I'd like to share them with you below. Check them out....aren't they beautiful?? ?